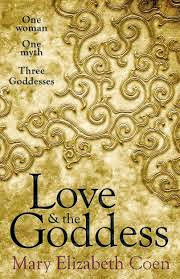 FlutterbyBooks: Love & The Goddess by Mary Elizabeth Coen. I chose to read this book as I saw it compared to Eat, Pray, Love which is one of my favourite books. There are a few similarities between the two novels, they both include women on a spiritual journey travelling abroad, enjoying their food and trying to decide if they are ready to love again following a separation. Unfortunately I didn't find the characters in this book as strong as Eat, Pray, Love. But without making comparisons between this book and any other, in it's own right it is essentially the story of Kate, who following a separation, tries to rediscover her priorities in life, by travelling, cooking and dipping her toe into the world of internet dating. Whilst the book was enjoyable enough to read I felt it lacked the spark needed to make it stand out from any other. To me it was an average example of a chick-lit read. For my personal taste I would have preferred more emphasis to be placed on the spiritual aspect of the book; I really enjoy those sentences that make you stop reading and think. Maybe that's what I was hoping for here but didn't find. But all in all a pleasant enough read. When cookery teacher Kate Canavan’s perfect life falls apart she moves to Galway City. Kate’s friend James urges her to love and nurture herself, but mischievous Ella persuades her to dust off her unused dating skills. So Kate explores the world of on- line dating using the name of a Greek Goddess. In the midst of a mad dating frenzy, Kate has a traumatic health scare which convinces her to drop everything and go in search of a guru. Travelling with Ella, she visits a spiritual healer in Brazil, only to find Ella is more interested in having fun than seeking enlightenment. Next stop Peru, where a shaman tells her how to harness the energy of the Goddess and the Divine Feminine. Kate’s journey of self-discovery continues apace after she returns home and events unfold in a surprising manner as she learns to think for herself.